Over the last 6 years, Belize has participated in the Caribbean Regional Testing Day initiative led by the Pan Caribbean Partnership Against HIV/AIDS (PANCAP). In 2017, the region celebrated the 10th anniversary of Regional HIV Testing Day (RTD), with a goal of reaching 100,000 people tested throughout the Caribbean over the 10 years of the initiative. RTD has, to date, tested some 90,807 people and is on track to meet the UNAIDS targets which lead to ending AIDS by 2030. 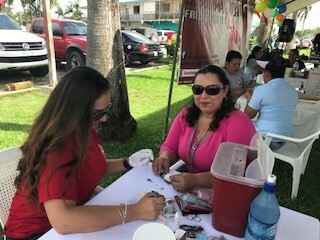 The National AIDS Commission (NAC) Belize, as a part of this Public Private Partnership; in collaboration with Scotiabank, the Ministry of Health (MOH) and Belize Telemedia Ltd. joined PANCAP and twenty other countries in the region to observe Regional Testing Day (RTD) on Friday, June 30th, 2017; under the theme: #knowurstatus! This year the NAC expanded the reach of the programme by utilising eight testing sites. In addition, the NAC in collaboration with MOH engaged the Police Department, Coast Guard and Fire Departments nationwide in the regionally recognised and awarded best-practice “On-site Testing Programme”. This programme, which ran from May 19th to June 26th, was designed to take the testing directly to these organisations to accommodate their busy schedules. Belize continues to be a lead entity in the region in the promotion and implementation of this event. Nationwide 32,635 HIV tests were done in 2016, with the general scale up in services, and a reduction in the total number of new infections; Belize has seen an HIV prevalence rate of 1.2%, the lowest in years. Regional Testing Day is a Caribbean initiative spearheaded under the guidance of PANCAP with key sponsorship from Scotiabank and support from LIVE Up: The Caribbean Media Alliance. This year Belize recognised Regional Testing Day under the theme: RU + UR- #knowurstatus! Visit the NAC (Belize) website here.